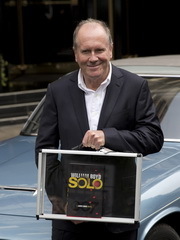 William Boyd’s new James Bond book, Solo, was launched today, Wednesday 25 September, with luxury, glamour and 1960’s flair at one of London’s most iconic locations, The Dorchester on Park Lane, London. Those passing The Dorchester in the morning enjoyed the rare sight of a line of Jensen cars parked outside the hotel. They included a Jensen FF Mark I, James Bond’s car of choice in Solo, which will transported the author around London. 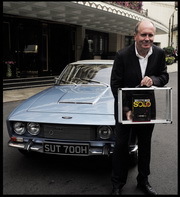 It all kicked off with a James Bond-inspired launch breakfast at The Grill at The Dorchester, where Boyd signed the first 7 copies of the book - Solo 001 to 007 - before entrusting them into the hands of ambassadors of another great British brand, British Airways. Each copy was allocated a dedicated cabin crew member, whose mission wa to guard it on its journey to London Heathrow airport. The cabin crew then traveled from The Dorchester in a convoy of 7 vintage Jensen cars– Bond’s motor of choice in the new book – each car marked with the country flags of each book’s destination. The cars were driven by their owners, members of the Jensen Owners’ Club. At Heathrow Terminal 5, a red carpet was rolled out in first class departures to greet the arrival of the cabin crew and their special cargo. Over the course of the afternoon, Solo 001 - Solo 007 were despatched to: Amsterdam, Edinburgh, Zurich, Los Angeles, Delhi, Cape Town and Sydney. Each book, encased in a perspex briefcase, was personally picked up by the captain of its plane and strapped into the cockpit for the duration of its flight. The 7 destinations from today’s launch were chosen for their connections to the international publication of the book, or their relevance to William Boyd, Ian Fleming and the original Bond books. Amsterdam is a major consumer of English language literature and therefore the natural choice of destination for Solo 001 in Europe. Holland–based publisher A.W. Bruna was the first international publisher to take and translate the original Ian Fleming novels in the 1950s; they are still in print today. On arrival in Amsterdam, Solo 001 will be filmed by Schiphol TV as it makes its way through the airport and arrives at the AKO Books & Travel airport store. The book will be showcased again on Saturday 28 September, as part of a major event at the AKO bookstore in The Hague, where it will arrive in a Jensen for a red carpet welcome. James Bond’s Scottish heritage is well-known. His father, Andrew Bond of Glencoe, is Scottish. On being expelled from Eton, the young Bond attends Edinburgh school Fettes, and it is where he learns some of the fighting skills he will go on to use in his career as a spy: ‘By the time he left, at the early age of seventeen, he had twice fought for the school as a light-weight and had, in addition, founded the first serious judo class at a British public school.’ (You Only Live Twice). Although William Boyd was born in Ghana, he shares Bond’s Scottish blood and was educated there at Gordonstoun School. Fleming himself had Scottish roots and once mused to a friend that he expected to eventually return to Scotland to live out his last years, ‘something calls you to the neighbourhood of your people’s place. It’s a mystique.’ In Solo, Bond spends a brief spell in Edinburgh, where he celebrates being discharged from hospital with champagne and oysters, smoked salmon and scrambled egg in an oyster bar off Princes Street.On arrival in Edinburgh, Solo 002 will be collected from the airport by Alex McGowan, Executive Director of the Lyceum Theatre. 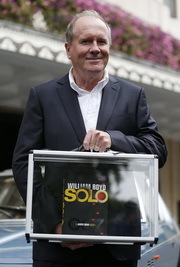 William Boyd will be talking on Solo at the Lyceum on Monday 30 September. Solo 002 will then be taken on a tour of the locations featured in Solo, including Princes Street, George Street and Waverley station. Then, on the night of Boyd’s Lyceum event, Solo 002 will be awarded to one lucky member of the audience, following a prize draw. Switzerland has a special significance to James Bond. His mother, Monique Delacroix, was Swiss. In Goldfinger, Zurich is one of the places Auric Goldfinger stores his gold. Solo will be published by Random House Europe on 26 September.On arrival in Zurich, Solo 003 will be transported to Orell Füssli’s ‘The Bookshop’, the largest English language bookshop on the European continent. There it will be put under lock and key until just before Christmas, when it will be put on display – along with memorabilia from the launch – in the window of the store. This special edition will make a Christmas present to remember for whoever wins the prize. ‘ Welcome to the USA, Mr Fitzjohn’ the immigration officer said, stamping his passport. ‘Business or pleasure? ‘Bit of both’ Bond said.’ Solo by William Boyd Filmic Bond has had long associations with Hollywood, but literary Bond also has his own connections with LA. In his non-fiction book, Thrilling Cities, Ian Fleming wrote: ‘Hollywood likes to have first bite at anyone who is ‘new’ and even moderately successful, and at twelve-thirty I was having lunch in the Brown Derby with a producer who wanted to make a fortune out of me in exchange for a glass of water and a crust of bread.’ On arrival in Los Angeles, Solo 004 will be collected from its captain by Robert Laycock, Fleming’s great-nephew, who lives there. Robert will then gift Solo 004 to the California-based Ian Fleming Foundation, along with the US edition of Solo (published by HarperCollins on 8 October), for their archive. During the winter of 1944, official war work took Fleming to India. He was conducting a review into the intelligence infrastructure of the newly created British Pacific Fleet, and whilst in the country he found time to visit his brother Peter, who was staying in Delhi. Solo will be published by Random House India on 26 September. On arrival in Delhi, Solo 005 will be picked up by a special Solo auto and taken on city tour where it will be photographed at key sites including the Red Fort, Qutub Minar and India Gate. Later, Solo 005 will be handed over to the Landmark bookstore as a competition prize. ‘As the plane taxied towards the terminal buildings Bond gazed out of the window at Africa, lit by the early morning sun.’ Solo Half of the action in Solo takes place in Zanzarim, a fictitious African country. William Boyd has long association with the continent and it is perhaps no surprise that he chose to feature Africa in the book. Solo will be published by Random House Struik on 26 September. On arrival in South Africa, Solo 006 will be filmed and collected by Expresso TV. On Friday 27 September, Solo 006 will arrive on set, via motorcycle, of the Express TV breakfast show where the CEO of Random House Struik, Steve Connolly, will announce the winner of a week-long competition on air. Ian Fleming travelled to Sydney in the winter of 1944 (following his stopover with Peter Fleming in Delhi). There he met a young lieutenant-commander who was desperate to obtain leave as he was engaged to be married. Ian Fleming duly fixed it for the young man. Solo will be published by Random House Australia on 26 September. 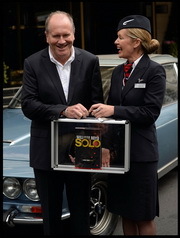 On arrival in Sydney, Solo 007 will be picked up and taken on a tour of Sydney’s key sites by Booktopia, before being awarded to a lucky competition winner.